We spend a couple of days at the launch of a project going through the Internet searching for portals, news sites and other resources like ours. At the same time we define key words for our project, for example art education, k-12 social studies, interdisciplinary, teaching, learning, etc. Searching the Internet using key words often leads to more key words and the ability to refine key words based on search returns. Next we draft a letter of inquiry that can be used repeatedly requesting a link or a listing of our product on related Web sites. The letter usually includes a long and short description of the project so you can send either, which ever is suitable for publishing, as well as the keywords from the previous activity that will help others find it on Web portals. For example on http://www.educating.net/addsite.htm is a form that requires site name, URL, description, contact name, email and phone. On other sites all that’s required is the letter we’ve drafted sent to an email address. Also don’t hesitate to request listings on teacher’s sites or blogs. Informal is as good as formal on the Web. Finally, we always track submissions on a spreadsheet so that if more information is required or a second contact is necessary there won’t be any duplication. 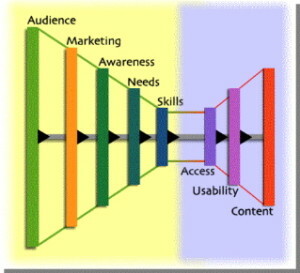 This diagram from Scott Sayre’s 2001 AAM presentation “Click, Click, Who’s There?” illustrates the multitude of barriers restricting a large audience from significant content. As the audience approaches access, it’s diminished by each of the barriers.